Giant snakes make be scary, but they are amazing in many ways. You may wonder how these creatures swallow animals that are bigger than themselves. Anyway, we always want to know more about the big snakes. Here the list of 8 largest living snakes in the world. 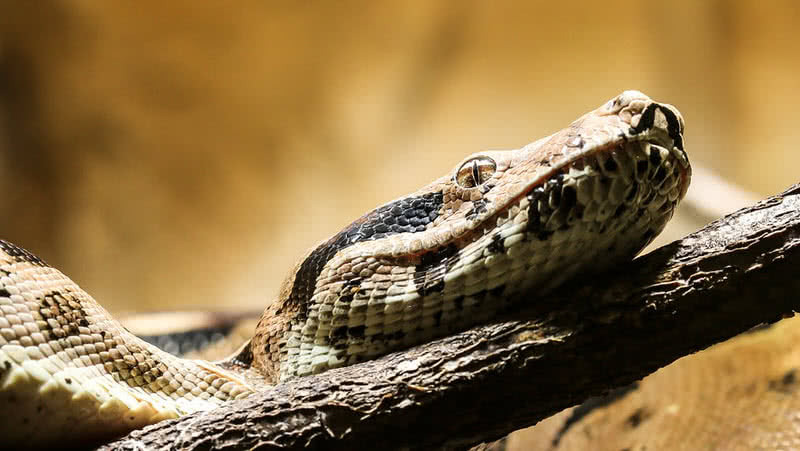 Boa constrictor is a large non-venomous snake which can grow between 12-18 feet in length and up to 45 kg in weight. They live in tropical rainforests, savannas and desert lands of Central and South America. The big boa constrictors also famed for their beautiful skin. Their body can be tan, red, green or yellow with dark cross bands and lines. As the name suggests, the heavy bodied-boa constrictor constricts their prey to death. They mainly prey on wild boars, deer, monkeys and birds. 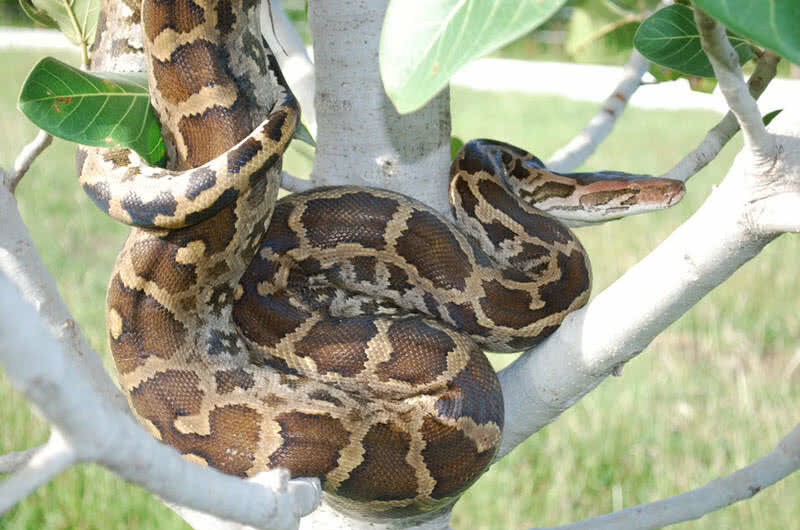 Boa constrictors are excellent swimmers can climb trees easily. But they spot on water very rarely and spend the majority of their lifetime on trees. 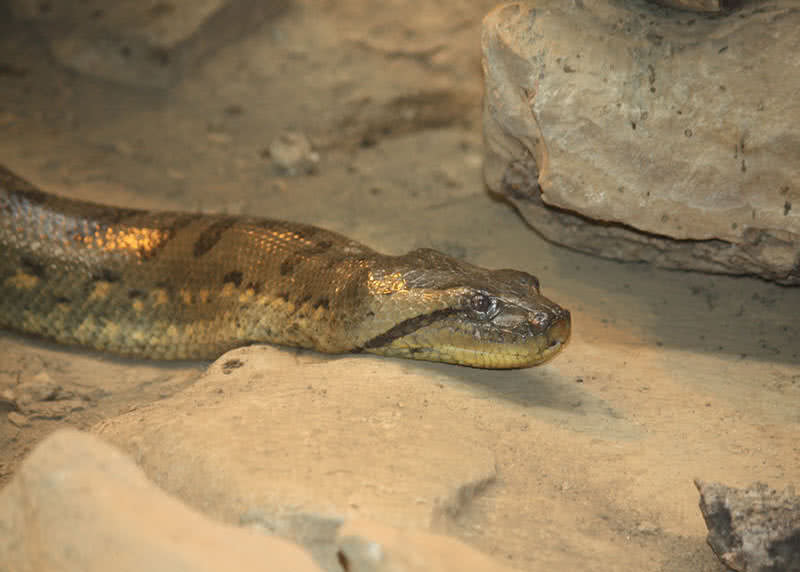 This large snake is a nocturnal hunter and relies on its heat-sensing pits to locate the prey. They can also sense the smell of the prey by flicking their tongue. The yellow anaconda is the second largest type of anacondas in the world. An adult yellow anaconda has a length between 10 and 15 feet and weighs up to 60 kg. Yellow anacondas are endemic to South America. They inhabit in swamps, marshes and rivers. This big snake is a non-venomous member of boa snake family. Yellow anacondas have very attractive yellow skin with black spots. So that they can hide in murky waters of rivers or swamps. The yellow anacondas are a strictly solitary snake and gather together only for mating. Yellow anacondas are ambush hunter, that is they wait for the prey to pass by and will make a sudden attack. After catching the prey, they coil around it and constrict to death. 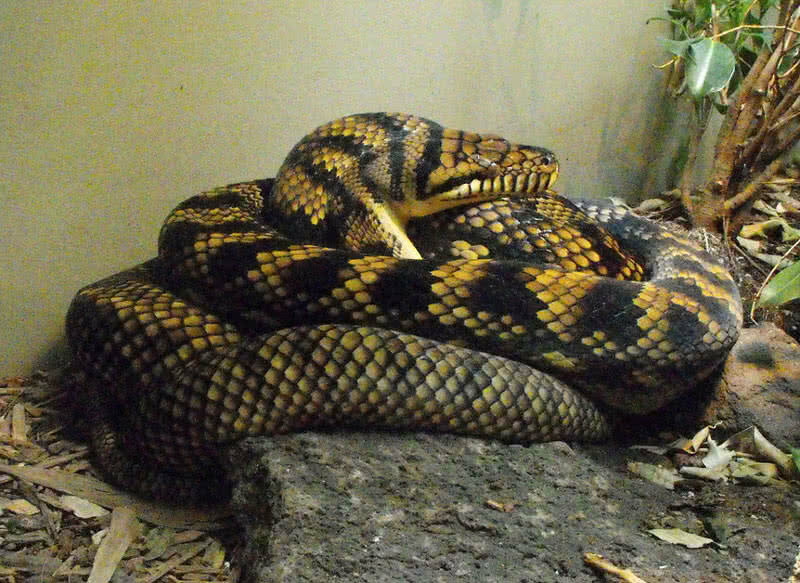 The diet of yellow anacondas consists of deer, peccaries, caimans, fishes and turtles. The amethystine python is among the world’s biggest snakes, both in terms of length and weight. These giant snakes measure up to 8.5 meters in length and up to 90 kg in weight. Amethystine python is also known as scrub python. They found in tropical rainforests and grasslands of Australia and Papua Guinea. The scrub python is Australia’s biggest non-venomous, living snake. Scrub python is a nocturnal snake which hunt only at night. 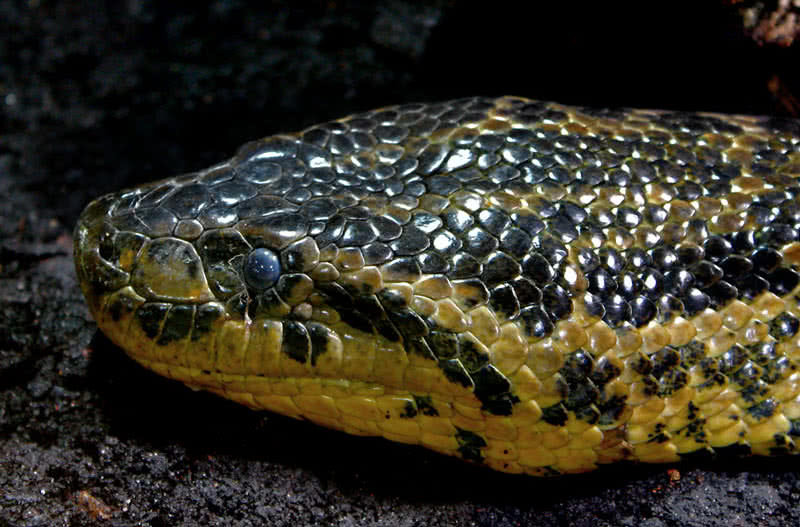 This big snake has heat sensing pits on its jaw to detect the prey. Scrub python is also an ambush hunter, wait for the prey to come within its reach and will make the sudden attack and kill it by constriction. 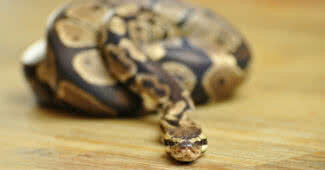 The scrub python mainly feeds on small mammals, birds, bats and rats. Indian python is a large, non-venomous, constrictor snake that found in South Asia. This big snake can reach a maximum length of 6.4 meters and weigh up to 91 kg. They inhabit in rainforests, woodlands, shrublands and marshes. The attractive skin of Indian pythons come in yellow, brown or cream in color with dark markings. These markings help the Indian pythons to camouflage against different backgrounds. Indian pythons can climb trees easily and also experts at swimming. This snake found the majority of their lifetime on the ground. Being a solitary species, Indian pythons only come together during mating season. Indian pythons typically hunt at night. They have heat sensing pits on upper and lower jaws to detect the prey at night. Apart from this, they also have chemical receptors to spot the prey. After catching the prey, the giant Indian python will kill it by squeezing. The diet of Indian pythons predominantly consists of rodents and other small mammals. They also eat birds and amphibians. The non-venomous African rock python is Africa’s biggest snake. They reach a maximum length of 7.5 meters and weigh up to 114 kg. This large snake inhabits in swamps, temperature grasslands and tropical forests of Western and Central Africa. The long, heavy body of African rock pythons are patterned with dark blotches and markings. It provides excellent camouflage against different habitats they prefer to live. Like other pythons, the African python first coil around its prey and kill it by constriction. They mainly prey on large rodents, antelopes, monkeys, pigs, monitor lizards and crocodiles. African pythons can live up to one year after eating a big prey like an antelope or a crocodile. African rock pythons become dormant during the dry season which means the temporary reduction of metabolic activity to conserve energy during harsh climate. The solitary African rock pythons join with another snake of the same family only during mating season. The Burmese python is the third largest non-venomous, living snake in the world. They can reach a length between 5 m and 7.6 m and a maximum weight of 137 kg. They live in marshes, swamps, woodlands, grasslands and river valleys of Southeast Asia. The Burmese python is also one of the most beautiful snakes in the world. Their body comes in different colors including grey, brown, yellowish-brown and tan with reddish blotches. Burmese pythons have very poor eyesight. But they have chemical receptors and heat sensing pits to spot their prey. They also have back-curving teeth which aid in seize the prey from escaping. Burmese pythons kill their prey by constriction. The hinged jaws also let the Burmese pythons to swallow the prey by the whole. They eat rabbits, rats, small birds, deer and pigs. After having a big meal, Burmese pythons can live for months without food. 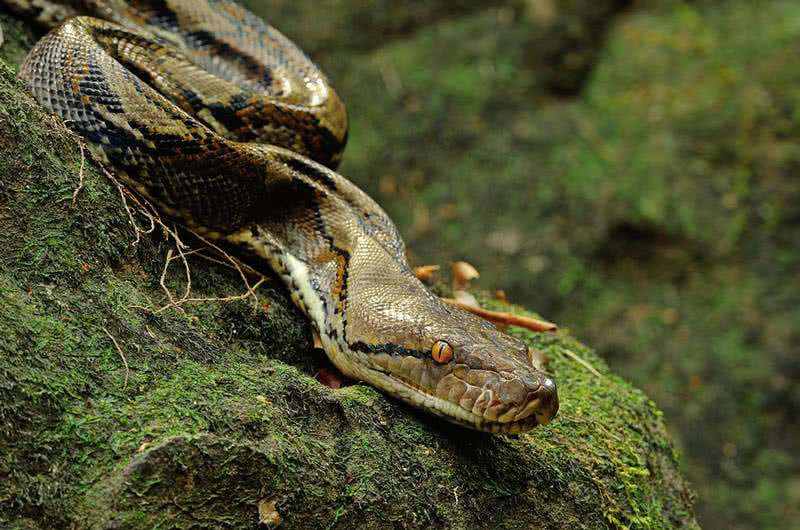 Reaching a maximum length of 10 m, the reticulated python is the longest living snake in the world. It is also the largest of all known species of pythons in the world. This giant snake gains a weight up to 135 kg. The reticulated pythons found on rainforests, woodlands or small river across Southeast Asia. It is a non-venomous snake and found predominantly on ground. Apart from the great size, the reticulated pythons are known for their striking coloration. Their skin comes in different colors including gold, black and olive green with brown blotches. This coloration and patterns also help the reticulated pattern to remain undetected on various habitats. 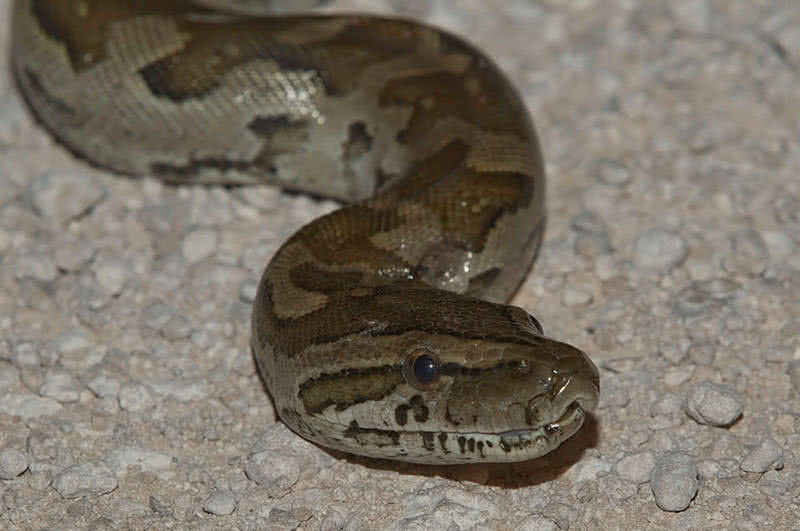 Reticulated pythons are solitary snakes and very aggressive. 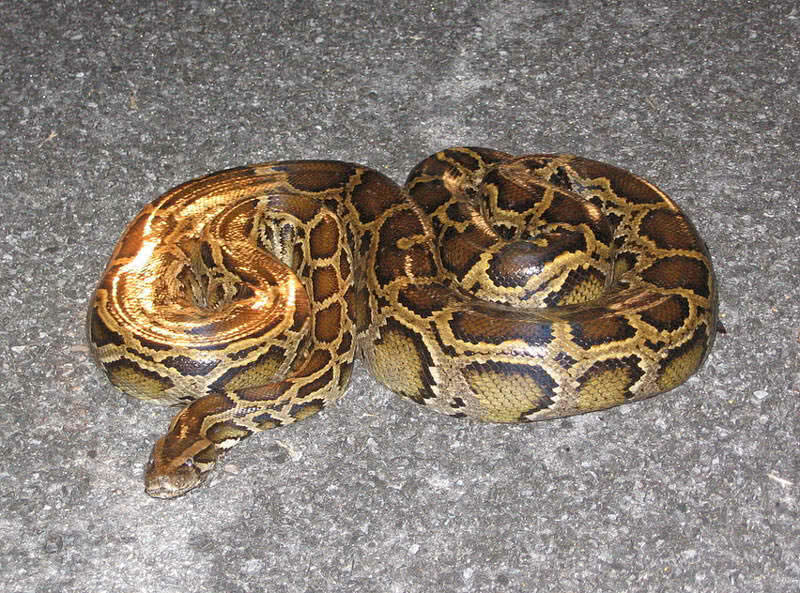 The reticulated python is a nocturnal snake, only hunt at night. They prey on monkeys, rats, civet, deer and pigs. Like other pythons, they also squeeze the prey until it stop breathing. The green anaconda is the largest living snake in the world. They can grow between 6m and 9 meters in length and weigh up to 250 kg, almost twice as heavier than the reticulated python ( the longest snake in the world). Green anacondas are non-venomous and found in swamps, marshes or rivers throughout South America. The female anacondas are larger than males. As the name indicate they have attractive olive green skin with black blotches. Contrary to common myth, green anacondas are not man-eaters by nature. Green anacondas are also known as water boa as they spend the majority of their lifetime in water. They can also swim at incredible speed on the water. The eyes and nostrils of green anacondas located on the top of the head. So that they can see and breath even when the most of their body is completely submerged. The green anaconda is a nocturnal snake. But it is believed to be they also hunt during the day. They have heat-sensing pits to spot the prey during the night. Like most of other giant snakes, green anaconda is an ambush, predator. They wait until the prey comes near to them. At right moment, the anaconda will strike the prey with an incredible speed. Then squeeze the prey until it suffocates and swallow the dead animal by the whole. Green anaconda’s diet list includes deer, tapir, caiman, crocodiles, fishes and turtles.